This year I purchased my private journal at the MoMA store in Rockefeller Center. I really enjoy city shopping especially around the holidays and this is one of the things I bought for myself. I try to buy my journals for the upcoming year when I am out doing something I love and all year long it serves as a joyful reminder each time I write. 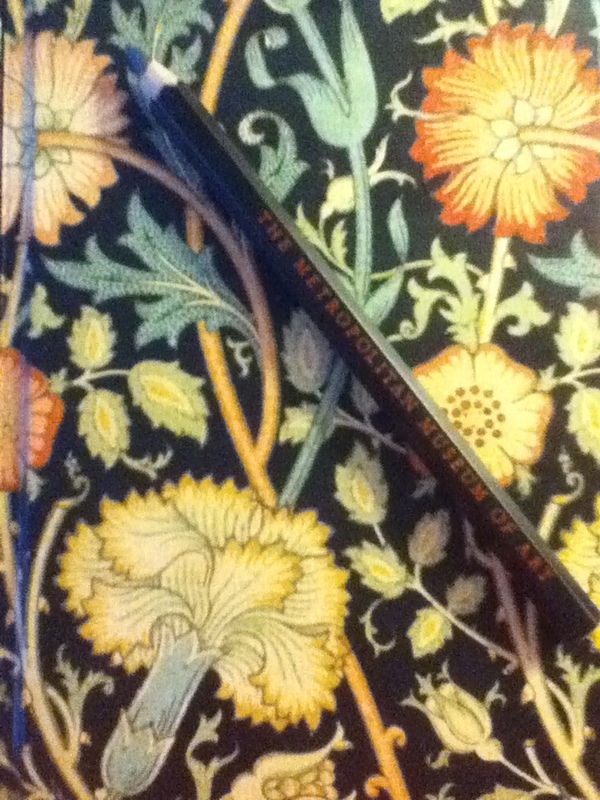 This year my journal includes artwork adapted from the works of William Morris (1834 – 1896). He is remembered as the English designer who, in his time, brought fine art into homes through his intricate, nature-inspired wallpaper, tapestries and other textiles. The cover and page borders of my journal feature bits of his design “Pink and Rose” (somewhat ironically, those were my unintentional colors for my new year celebration; I rarely wear these colors). Other details feature bits from “Curtain”, “Wild Tulip”, and “Fruit on Pomegranate” (one of my new year traditions). This journal really seemed to fit into this new year without any plan… I simply loved the design and bought it. Now that the new year 2013 celebrations are over most of us are trying to settle into our “normal” routines (or maybe some of us have resolved ourselves to an entirely new routine). Handwritten journaling is something I love to do. In the late 1990’s/early 2000’s I tried to only journal on-line and I always felt like I was missing something in the process… aside from that I like an excuse for carrying around a lovely book. Previous Pomegranates and New Beginnings! Next Happy Birthday J.R.R. Tolkien; Thank You for The Stories!